Our approach to your packaging challenge simply put: discern your intent, collaborate with your creative resources, design and engineer your solution, and then produce your premium, brand-defining packaging. We combine the exacting craft of box making with the world’s most advanced manufacturing equipment; mix in an uncompromising commitment to creating client packaging that is a focused expression of both the strategic purpose behind the package and the essence of their brand. Finally, underpin all this craft, process and technology with a 125 year tradition of creating challenging and successful projects, and you have all the elements of our approach to delivering premium specialty packaging. Taylor Box provides services as both designers and manufacturers of premium packaging. Our talented design team has decades of experience in engineering outstanding packaging solutions. Combined with our devoted sales team, Taylor Box is capable of designing unique, custom boxes to your specifications. Our in-house manufacturing capabilities include foil stamping, embossing/debossing, die-cutting, automatic assembly, hand assembly, rigid paperboard boxes and woodframe boxes. At 750ml, the Royal Salute 21 Year is a hefty product. To accommodate such substantial contents, a wooden frame box was the best choice. The tray in three panel folder design maximizes protection and allows easy access. Iris book cloth gives texture and provides distinct color. This is a box which can tuck away neatly in a liquor cabinet or display prominently behind a home bar without fear of damage. Simple base and lid design with intricate foil stamping for Nodding Bur Originals. Effen Vodka finds a home in this tray in a three-panel folder wrapped in a Brillianta book cloth with silver foil stamping on the exterior. King\'s Crest Liquor Box housed a 25 year old Blended Scotch Whisky (750mL) and features beautiful combination foil stamping and embossing. If you liked October’s Box of the Month, you’re in for a treat. We’re proud to introduce the sister piece to October’s Goslings Old Rum box, a regal limited edition box for one of Goslings most ambitious products; Papa Seal Single Barrel Bermuda Rum. Klim Design collaborated with Taylor Box to create packaging for this exclusive spirit. The finished product is an artful contrast to our last featured Goslings box, demonstrating the wide variety of premium liquor packaging Taylor Box is capable of producing. Goslings rum is a heritage product, crafted with care, utilizing distillation techniques that have made Goslings an industry leader. We profiled Goslings storied history and exacting craftsmanship when we looked at Goslings Old Rum, their premium Family Reserve. But Goslings is capable of even more. They set out to make the Father of all Rums, and the result was the incredibly limited, super exclusive, and critically acclaimed Papa Seal. Goslings Papa Seal is aged for fifteen years in hand selected bourbon barrels. The particular climate of the island of Bermuda is attributed to a distinct aging process, imbuing the product with salt air in a humid tropical environment ideal for barrel aging. Just twelve barrels of Papa Seal were produced, translating to around 2,500 bottles in existence. Ever. Each bottle comes with a hand-written barrel number, bottle number, and bottling date on the label. It’s about as limited edition as it gets. Klim Design agency is responsible for devising some of the most memorable brand experiences on the market- especially when it comes to premium liquor packaging. Given the incredibly high-end nature of Goslings Papa Seal, they trusted Taylor Box to make this limited edition box a reality. If we’re going by appearances, the most remarkable feature of Papa Seal Single Barrel Bermuda Rum is the color. A deep amber-red hue makes the spirit stand out, and boxing up that auburn elixir would be a shame. The beauty of the spirit comes through thanks to a crystal clear bottle adorned with a hand-written label. The product itself is gorgeous. Too gorgeous. It would almost be selfish to hide that. A die-cut window on the lid of the limited edition box makes the Papa Seal bottle the star of the show. Whereas the Old Rum box relied on foil stamping and screen printing to approximate the appearance of the bottle, the Papa Seal box is purely a vessel to accentuate the inherent beauty of the product. Nothing less than a frame for a work of art. Rainbow Paper from Ecological Fibers covers the box. Combined with copper-tinged foil stamping, the decoration of the box is deliberately designed to highlight that incredible rum. The wrap evokes something like brown leather, a color that seems to summon feelings of antique, tradition, and dark flavors and aromas like tobacco and bourbon. The foil stamping work is once again exceptional here, as it was in October’s Goslings Old Rum box. And while we feel a little vain endorsing our own work as exceptional, it’s difficult not to. The minute our foil stamping department stops doing jaw-dropping work is the minute we’ll stop gushing about it. Until then, there’s going to be a lot of talk about foil stamping around these parts. This copper foil is among the most lustrous featured in our recent work. It catches the light in the most magnificent way possible, revealing metallic textures and reflecting back an inviting, warm glow to the beholder. Two bands of copper foil wrap around the edges of the box. The Goslings logo appears along with the signature seal, rendered here in breathtaking clarity, right down to the intricate cross-hatched lines in the barrel of rum balanced on the seal’s nose. This limited edition box combines vintage sensibilities with modern flair. It demonstrates the adept talents of Klim Design in creating a consistent brand identity across several iterations of packaging, utilizing entirely different color schemes, shapes, and forms- all anchored by the ubiquitous Goslings seal. The Papa Seal box provides a worthy contrast to the Old Rum edition and is emblematic of the unique properties of packaging when liquor meets limited edition. We’ve all been there.You’re at a party and you put your drink down, just for a second, certain you’ll come right back and get it. Then, tragedy. You can’t remember which of those identical wine glasses clustered on the counter was yours in the first place. Do you try and match your lipstick to the shade smeared on the rim of the glass? Do you just roll the dice and pick one at random, praying you don’t contract some horrible disease? Likely, you’ll just get a new drink, dooming that half sipped glass of Chardonnay to be dumped down the sink. Stemware charms make this problem a thing of the past. Stemware charms are stylish trinkets that attach to the base of a wine glass at the stem. These charms not only add a touch of flair and panache to your glassware, but help partygoers keep track of their drinks. At Nodding Bur Originals in Foxboro, Mass, Barbara Graveline and Paula Kelly are creating bespoke stemware charms for every occasion. A wine glass represents celebration. Stemware charms, like those made by Nodding Bur, not only add a touch of personality to a special occasion, but also make it personal. The pieces created by Nodding Bur Originals can be customized with names, dates, phrases, and symbols, to name a few. At Taylor Box, celebrations are right up our alley. After all, what’s at the core of every birthday party, baby shower, and wedding reception? Gifts! And gifts need packaging made to stand out. As a Taylor Box client, Nodding Bur Originals knew they needed a custom retail box that would delight anyone lucky enough to receive it while impressing bystanding partygoers. A custom retail box not meant for store shelves, but for exclusive, hand-picked recipients. The humble design of this custom retail box only enhances the brilliant product within. We produce our share of extravagant, unconventional boxes at Taylor, but the simple base and lid construction remains one of the most versatile and popular boxes. The earthy mocha hue of the outer wrap is reminiscent of the natural world. Like coffee grounds, or fresh upturned soil, the color soothes the viewer and invites closer inspection. A prominent floral decoration garnishes the lid of the box in resplendent silver foil stamping. That flower is, of course, none other than the nodding bur-marigold, the namesake of Nodding Bur Originals renowned for its resilience and understated beauty. The shallow base is perfectly suited to present a set of charms to someone special. There is just enough room for the charms, no vacant space or need for a special insert. The focus is solely on the opening and revealing with the confidence that the charming product within will wow. 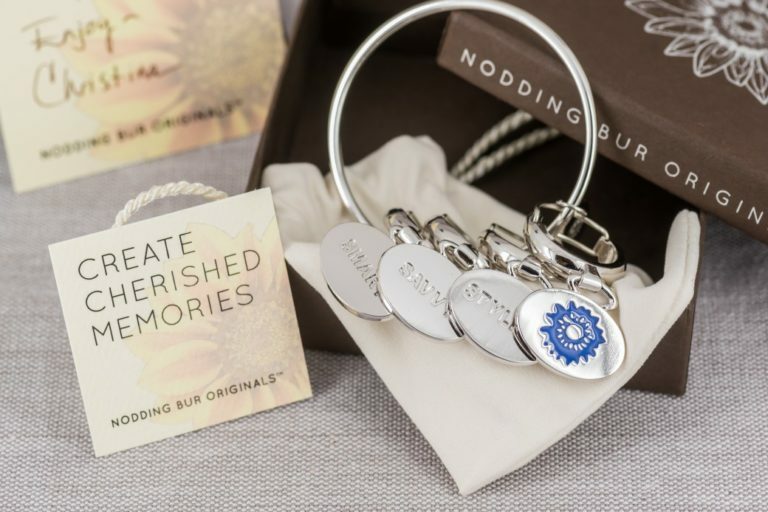 On the interior of the box, along with a selection of stemware charms, comes a message from Nodding Bur, “Create Cherished Memories” which doubles as a note card to send personalized messages to the ones you care about. Taylor Box cherishes the opportunity to collaborate with small businesses in the New England area. We are, after all, a small shop in Rhode Island ourselves. This custom retail box is a prime example of how a simple design can perfectly align with the branding needs of even the most niche products. If there’s one thing we love, it’s new equipment. 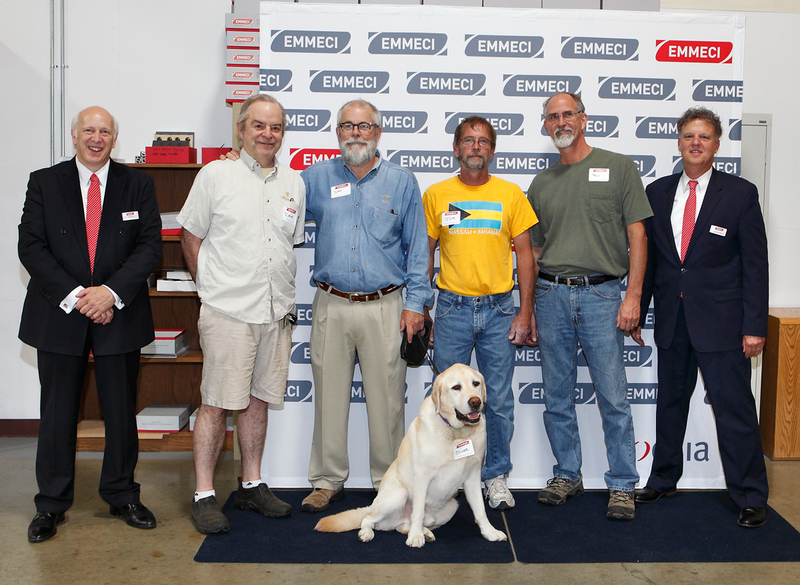 Which is why we’re proud to announce the addition of two brand new machines to Taylor Box, the Emmeci MC-2018-Digital line and the MC-79 Robotic Box Closer. 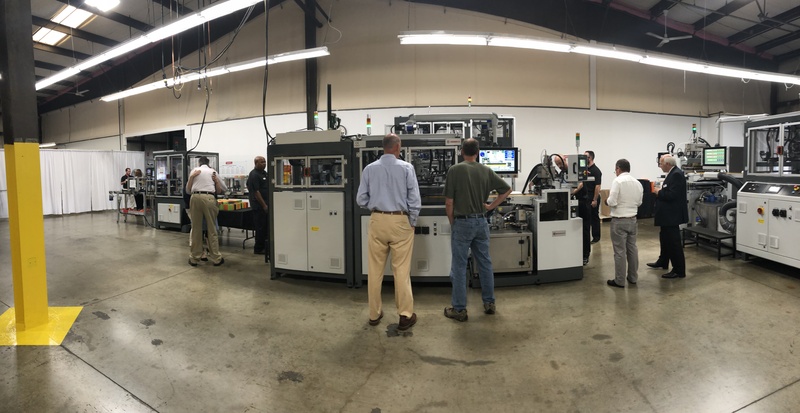 These machines are designed to produce small to medium size boxes, and their installation at Taylor Box will be the first at any facility in the USA. The addition of these new machines to our fleet gives us an advantage in producing high quality rigid boxes with greater speed and precision than ever. We use a remarkable mix of old and new at Taylor Box. We depend on our Hand Department to complete detail work on our boxes that couldn’t be accomplished by machine. Our vintage Heidelberg and Kluge machines date back decades and are as reliable as day they were made. But as we continue to expand our business, large quantity orders need to addressed with reasonable accommodation. That’s where Emmeci comes in. These machines will assemble base and lid boxes automatically, placing the lid on the base, saving valuable time in the manufacturing process. According to President Dan Shedd, “This investment keeps TBC at the leading edge of premium paperboard packaging manufacturing technology”. Packaging technology is only getting better, and we’re determined to keep up with the times. Stay tuned for the big installation coming later this month! Taylor Box Is Now FSC Certified! Is sustainability a concern for your business? Is responsibly sourced packaging important to you? If so, you have another reason to partner with Taylor Box. Taylor Box Company was recently recognized as an FSC Certified manufacturer. The Forest Stewardship Council (FSC) is an international organization responsible for more than 380 million acres of forests and the many paper products that come from them. The FSC stamp of approval is recognized as the gold standard of responsible forestry by organizations like Greenpeace, the World Wildlife Foundation, the Natural Resources Defense Council and more. This certification means that the paper we use in our work is treated with respect at every stage of the supply chain; from tree to box. Although we don't manufacture paper ourselves, paper is the basis of all of our work and we rely on qualified suppliers to do business. Many of these suppliers are FSC certified themselves and have implemented comprehensive environmental responsibility practices. Whether it's a premium chipboard like Eska, or an exceptional paper wrap from Ecological Fibers, our suppliers have demonstrated a commitment to sustainability. It all comes together at Taylor to create a sustainable, FSC Certified box. In terms of packaging, paper is the clear sustainable choice. Paper is inherently renewable, biodegradable, and generally (but not always) recyclable. In the US, most paper for manufacturing comes from managed forests. And of all timber harvested in the US, only 36% goes to create new paper. 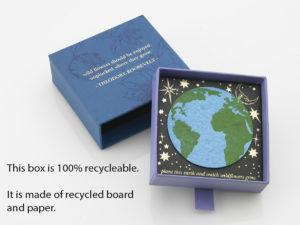 The remaining 64% is made from recycled paper materials. So if the thought of a virgin tree being felled for your packaging makes you depressed, don't fret. There's a two-thirds chance that box is already recycled. 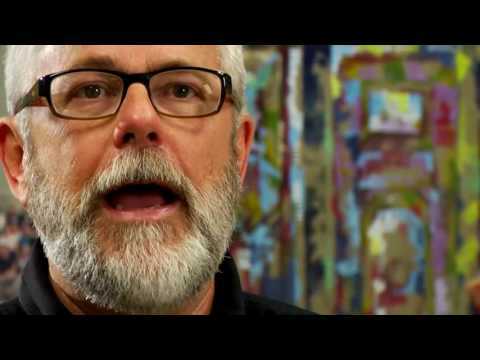 But does FSC Certfication matter to customers? A 2014 Nielsen survey revealed that 55% of online global consumers are willing to pay more for products and services provided by companies committed to positive social and environmental impact. Accordingly, the burgeoning Millenials market values social responsibility and brand trustworthiness as the ultimate criteria for their purchases. Knowing that the packaging is FSC Certified could be the difference in deciding between two comparable products. Taylor Box is proud to be FSC Certified and to join the ranks of environmentally conscious manufacturers the world-over. If sustainable packaging is a must for your product, you can trust Taylor.